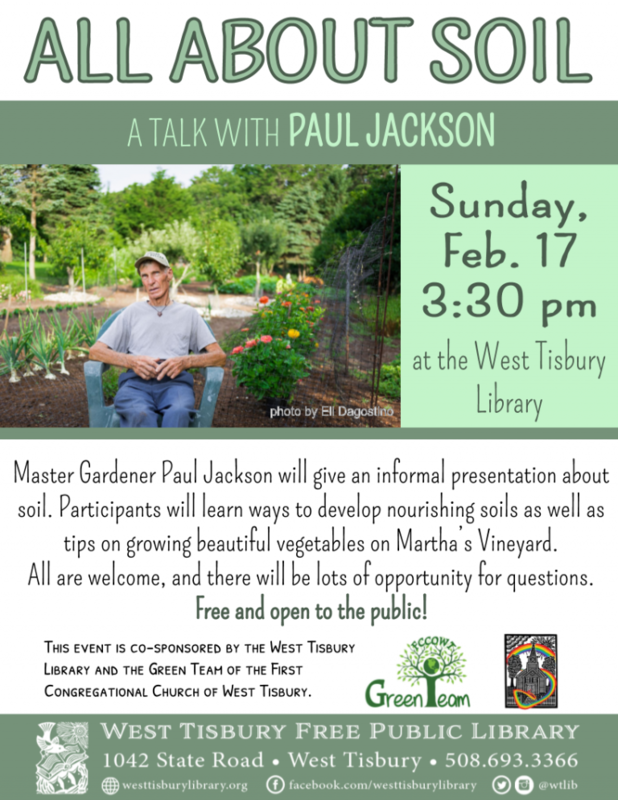 On Sunday, February 17 at 3:30pm at the West Tisbury Library, Master Gardener Paul Jackson will give an informal presentation about soil. Participants will learn ways to develop nourishing soils as well as tips on growing beautiful vegetables on Martha’s Vineyard. Paul will also share garden photos and provide butternut squash seeds to take home. All are welcome to attend, and there will be lots of opportunity for questions. Refreshments will be served. This event is free, open to the public, and organized by the Green Team at the First Congregational Church of West Tisbury. The Green Team will be offering a series of environmental programs at the library throughout the winter and spring. Paul Jackson tries to eat only what he grows, catches, and kills. He and his partner Ellen live on fish, scallops, venison, and the vegetables they grow. They have three freezers and a root cellar. Paul built his own greenhouse. Paul is in touch with soil and nature, and he was involved in bringing the bluebird back by putting up hundreds of bluebird houses. He has won many bow hunting awards, and he has one of the best (if not the best) arrowhead collection. As a gardener, Paul has won hundreds of Ag Fair blue ribbons. He loves to share his knowledge and love of gardening.